Created to help cut down trees for the lumber industry. The cutters atop his head are made of a heavy-duty material called ceramic titanium, and can be removed and used as a boomerang! CutMan is not your conventional boomerang-throwing bad-guy. He's actually pretty agile and at times - difficult. 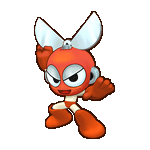 CutMan's Rolling Cutter is his main attack - a boomerang that shoots out in an arc shape and comes back to him. CutMan has a way of jumping before it comes back to him, however, that makes it take another loops towards you! This extra loop is what normally throws people off and in hard-mode CutMan does this a lot. The best way to avoid being hit by the Rolling Cutter is to jump over it thr first time, and when it comes back for a second (or third) blow - just run under CutMan as he jumps and the boomerang will be forced to return to CutMan's head. CutMan's other attack is his Giant Cutter. This attack can do a lot of damage, but luckily it's easily avoided by hugging the wall on the other side of the room. CutMan is agile, but as long as you pay attention you should be able to handle him in no time.